The desperate, the pure-at-heart, the charmingly manipulative, the wise, the deluded— mothers and children of many stripes populate this collection of stories by Avery Caswell. The voices that usher us through Avery Caswell’s elegantly biting and wonderfully written collection of stories, MotherLoad, put me in mind of John Cheever: characters plagued with endearing ennui, and chic self-destructive urges. Their salvation, however, is cynicism and a fabulously dry sense of humor. The language in these stories is immaculate, playful, often mugging with the wit and kick of Dorothy Parker and Lilian Hellman. And, yes, these stories are loaded with mothers – yours and mine – evoked with confusion and paradox, harrowing truth and indisputable love: elegies, praise-songs, lambasts. This is convincingly good writing. 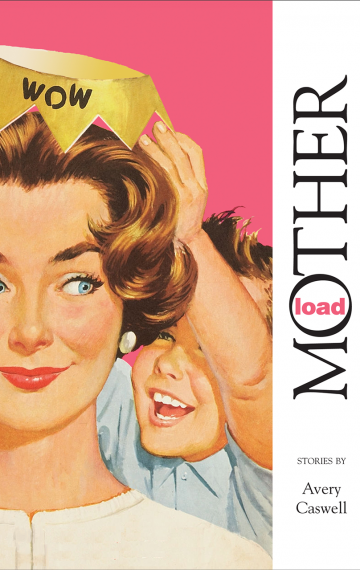 MotherLoad is a marvel, packed with richly drawn and often haunting characters. Caswell writes with gorgeous precision in an astonishing range of voices and styles, all shot through with a wonderfully wry sense of humor. From the terrifying Mother Franklin to the tough, broken narrator of “Irish Twins & Thoughts of Suicide,” Caswell’s characters deepen our sense of what it is to be human. Avery Caswell’s stories deeply inhabit their worlds. Inside these story-worlds, Caswell’s characters get under the skin and dance. I left Caswell’s world aching but aware, always, of the possibility of magic. Lightning streaks in from the west. Rain sets in. The stories in MotherLoad remind us of wind and moonlight and possibility. Caswell is such a gifted sentence-level writer. For instance, in “Guinea Pepper,” she describes the seasons: “Summer that year had refused to drop away and the line between it and autumn blurred, congealed like old jam. Too much of a good thing, past its prime.” When that gift is put to good use, as in the impressive closing story, “Salvation,”the results are striking. “Two dollars, Lute Jackson,” she hollered, “and not a drop more!” Mother Franklin, sixty-six years old and measuring about that many inches around, stepped out of the car. She seemed an improbable mother. But the breadth of her stance, the strength of her gaze, and her righteous discovery of a handkerchief from within her square black pocketbook lent partial credence to the title which was given to her years ago when she might have had children, but had chosen not to. Instead she mothered flocks of children, God’s children. She drew attention standing there in her sateen purple dress that looked more like a choir robe than regular street clothes. Even pleated like it was, the dress strained at every seam. Everything about her was big — her feet, her neck, even her elbows. Her very breath was big and heavy. She stood there as if she needed a tugboat to get moving. Mother Franklin fanned her face and kept an eye on the gas pump while Luther walked around to the front of the saggy gray station wagon and raised the hood. Luther was as skinny as she was fat. They looked like a black Jack Spratt and his wife, except no one would think they were married — mother and son, maybe. He was at once dutiful and threatening. Seeing them together on the street, people might wonder, would he be nice and offer his arm, or push her from behind? “This ol’ heap’d do better if we just filled the tank all the way every once and again,” he said. She was tired of his threatening to quit, too. He ought to be more grateful. He was lucky she’d hired him as her driver. Without her, he’d be starving on the side of the road. All she had to do was say, My driver. A plate for my driver, and didn’t the church ladies provide? That wasn’t begging, no matter what Luther said. She didn’t beg; she just knew how to ask. She pulled two one-dollar bills from her purse. “Go on and pay now,” she said knowing Luther was in a hurry to be on his way. Lute Jackson liked staying on the move. He liked not knowing where he’d be from week to week because if he didn’t know, then no one else did either.